Purpose: Full production ticketless entry system for the professional entertainment industry. Description: Justarrive, Inc. is a leading electronic ticket and marketing services provider for the sports and entertainment industry. I founded Justarrive with 3 friends in June of 1999 which took us on a wild ride of developing the most advanced electronic ticketing system in the market place today. 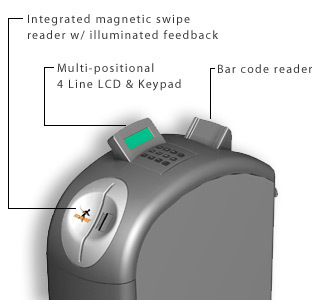 This product represent the hardware portion of a full scale networked system of servers and websites that enables complete point of entrance electronic ticketing. This entrance unit represents a full production scale product and was developed in conjunction with IDEO (design) and D2M (engineering) over a 7 month period. Justarrive previously developed 2 prototype hardware systems as proof of concept that provided the many user needs and insight. Believe it or not, the first prototype in use was made from a garbage can. -- Supports both portable and permanent installations.